This comprehensive book provides students with a "grand tour" of the tools needed to measure digital activity and implement best practices for using data to inform marketing strategy. It is the first text of its kind to introduce students to analytics platforms from a practical marketing perspective. Demonstrating how to integrate large amounts of data from web, digital, social, and search platforms, this helpful guide offers actionable insights into data analysis, explaining how to "connect the dots" and "humanize" information to make effective marketing decisions. The author covers timely topics, such as social media, web analytics, marketing analytics challenges, and dashboards, helping students to make sense of business measurement challenges, extract insights, and take effective actions. The book’s experiential approach, combined with chapter objectives, summaries, and review questions, will engage readers, deepening learning by helping them to think outside the box. 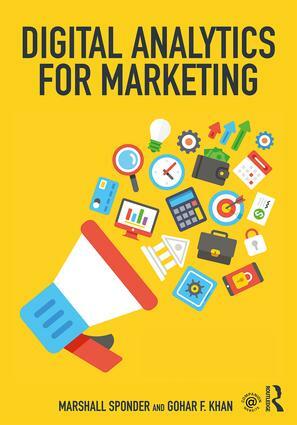 Filled with engaging, interactive exercises, and interesting insights from an industry expert, this book will appeal to students of digital marketing, online marketing, and analytics. A companion website features an instructor’s manual, test bank, and PowerPoint slides.